Beijing was sanctioned for buying Russian weapons. The status of U.S. and Chinese military relations appears to be deteriorating less than one week after the Trump administration imposed sanctions on Beijing for its purchase of Russian weapons and equipment. The souring of relations followed a decision by the Trump administration last Thursday to sanction a Chinese military body and its director for "significant transaction" with Russia's defense and intelligence sectors -- which is prohibited under a new law passed by Congress last August called Countering America's Adversaries Through Sanctions Act, or CAATSA. Last week's announcement was the first use of the new sanctions authority meant to "impose costs upon Russia," according to a senior administration official. China was sanctioned for its purchase of Russia's S-400 missile system and Sukhoi Su-35 combat aircraft, perhaps leading nations like India and Turkey to wonder if they could also face sanctions for similar purchases from Moscow. 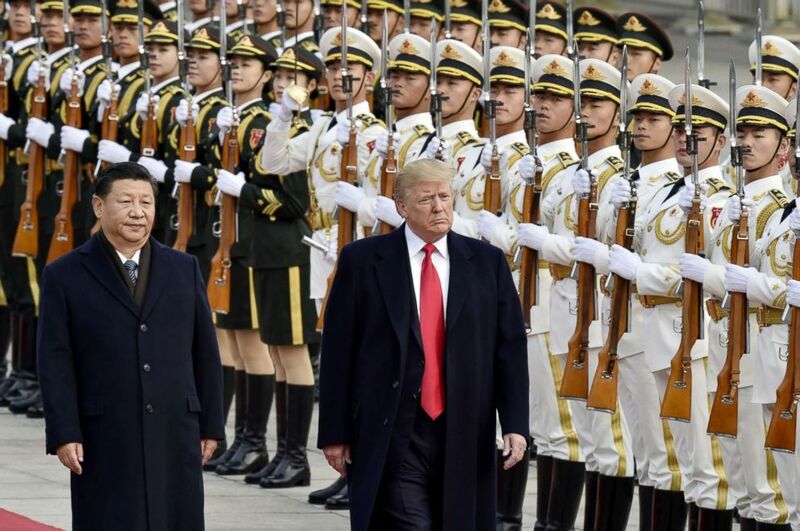 (Kyodo News via Getty Images, FILE) President Donald Trump and Chinese President Xi Jinping attending a welcome ceremony in Beijing. In the aftermath of the announcement, Beijing called on the U.S. to "immediately correct its mistake" and revoke the sanctions, adding that the Chinese military reserved the right to take further countermeasures, according to the South China Morning Post. Asked if Beijing's decision to postpone bilateral military talks was a "setback" for U.S. and China relations, Defense Secretary James Mattis said, "It's too early to say." "We're still sorting this out," Mattis told reporters at the Pentagon on Monday. "We believe that we do have to have a relationship with China, and Secretary Pompeo and I are of one mind on this. And so we're sorting out the way ahead right now." "This proposed sale will contribute to the foreign policy and national security of the United States by helping to improve the security and defensive capability of the recipient, which has been and continues to be an important force for political stability, military balance, and economic progress in the region," the State Department said in a release. In contrast, China's Foreign Ministry spokesman Geng Shuang called the $330 million sale a serious breach of international law and harmful to Chinese sovereignty and security interests, Reuters reported. President Trump used his address to the United Nations General Assembly on Tuesday to bash China for intellectual property theft and tariffs on U.S. goods, saying "China's market distortions and the way they deal cannot be tolerated." Speaking at the University of Louisville on Monday morning, CIA Director Gina Haspel accused China of "working to diminish U.S. influence" while expanding its own. ABC News' Conor Finnegan contributed to this report from the State Department.